With the playoffs starting in another few days, the four teams that will still be in contention for the postseason championship will be devising ways of keeping champagne chilled but hidden away until the precise moment when it is wheeled into the winning clubhouse. It has a new all-time managerial king in Lancaster's Butch Hobson, attendance has topped 2,000,000 for the fourth consecutive season and two pitchers who worked out kinks in their lengthy careers in the league late this summer have not only returned to major league organizations but are providing a lift to their parent team in these final frantic weeks. Rich Hill has gone from Long Island to make what could be a career-reviving start for the Boston Red Sox and Tim Stauffer has jumped from Sugar Land to a potentially pivotal role for the postseason-bound New York Mets. Stauffer's first appearance with the Mets may not seem like much since he gave up two runs in an inning to Atlanta in his only major league outing since leaving Sugar Land, but the National League East-kingpins are suggesting the 33-year-old right-hander is one of the possibilities for eating up valuable innings when they lift ace Matt Harvey midway in starts to protect his Tommy John-recovering elbow from being overworked. Stauffer started this season as a reliever for Minnesota, but it was three July starts for Sugar Land (1-1, 1.68 in 16 innings) that got him stretched out for longer stints before the Mets purchased the major league veteran's contract and sent him to Triple-A Las Vegas to stand by for the NL stretch run. Hill, a valuable lefty with 197 major league games already under his belt (24-22, 4.72) but not a single start since 2009, started two games for Long Island (21 strikeouts, two hits in 11 scoreless innings) before Boston came calling, and the 35-year-old just may be putting himself into consideration for a starting role for the re-tooling Red Sox next season. He could not have been better in his initial start for the Red Sox, a seven-inning shutout stint in which he allowed only one hit and struck out 10. "It was a pretty special moment for Rich to walk on the mound," interim manager Torey Lovullo told MLB.com. "Just a great story. He gives us seven solid innings. You can see that all the hard work that he put in (Washington released him June 24)--everything that he did behind the scenes to get back here--paid off. Fastball command (consistent at 92 mph), the secondary stuff was there, and any time he needed a big pitch, he seemed to make it. There will be at least two more starts for Rich." 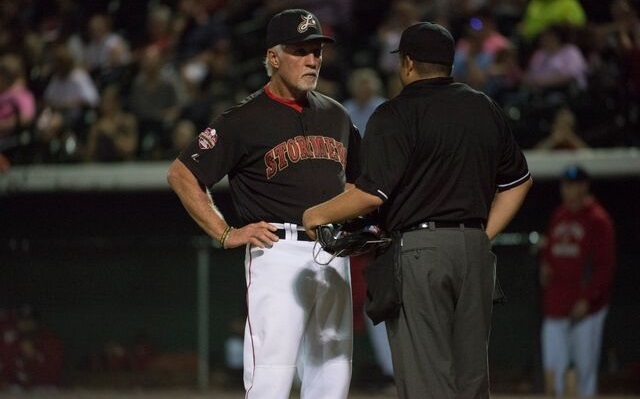 Hobson, who has Lancaster on the brink of winning another divisional title, has now managed 1,032 Atlantic League victories with Nashua, Southern Maryland and the Barnstormers and has overtaken former Somerset skipper Sparky Lyle (1,025 wins) as the top winner in league history. "Butch has had so much success because he cares so deeply," praised Lancaster general manager Kristen Simon. "He cares about his players, he cares about the game, and he cares about the fans." League attendance was reported at 2,081,211 through Monday, an average of 4,081 for each of the 510 openings. Six days remain in the regular season.